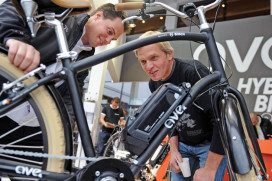 Looking at the number of market entrants and product innovations, the 2013 season is shaping up to be yet another successful year for e-bikes. 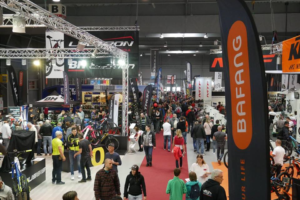 This seems certain in light of the new products slated to be shown at Eurobike. 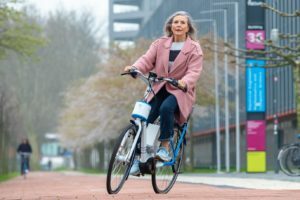 All signs point to a significant growth of the e-bike market next year, with several new types of drive systems and new manufacturers entering the market like AEG. Until 2012 the number of drive systems currently available could easily be counted on two hands. In 2013, more hands are needed for that. 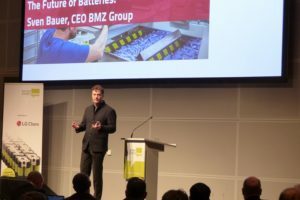 For example, one new manufacturer of e-bike systems that has registered to attend Eurobike this year for the first time is the long-established brand AEG. The Taiwanese company TranzX, which is already one of the main stream manufacturers of front-mounted motors, is also gearing up to present mid-mounted motors at Eurobike. Its new M07 system comes in two models of differing strengths, with a range of up to 75 miles. While the range of e-bikes with mid-mounted motors is growing, manufacturers that have so far been known for this type of design are going in the opposite direction – at least when it comes to optional features. For example, the Japanese company Panasonic, which pioneered e-bikes with mid-mounted motors, will also be offering rear-mounted motors in 2013 that will be included in e-bikes from KTM, among other manufacturers. Derby Cycle is another manufacturer that traditionally used mid-mounted motors and will be offering rear-wheel motors as an option in 2013. The company, which includes the brands Kalkhoff, Raleigh and Focus, is expanding its own range of motors to include the new Xion rear-wheel drive system, which will primarily be included in sports-oriented models. 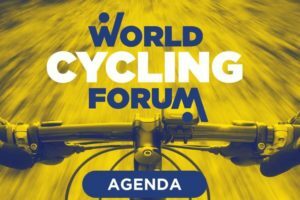 The Korean manufacturer Mando will be presenting its Footloose drive system at Eurobike, which is perhaps an even more visionary technology. This system features an important detail that might not be noticeable even at second glance: there is no visible means of transmitting power between the bottom bracket and the rear wheel, such as a chain, belt or cardan shaft. The key to this riddle is a generator contained in the bottom bracket, which feeds a battery that powers the rear-wheel motor. If desired, the Mando can operate like a conventional bicycle. In this case, the electronic system powers the motor according to the power that the rider applies to the crank by pedaling. The system can also be used like a moped by with a throttle. Some e-bike experts believe that this technology is the future of drive systems. 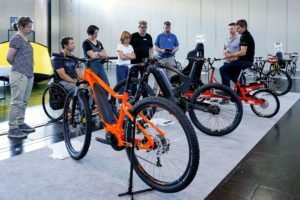 Thus, the e-bike manufacturers at Eurobike will continue to offer exciting opportunities for visitors, especially considering that many of the new models for 2013 will be available for test rides at the exhibition grounds in Friedrichshafen.